Investiture Achievement Connection: This Honor is related to the Investiture Achievement requirements for FRONTIER GUIDE Nature Study which require (as one of two options) an activity which meets Requirement #2 this Honor. This Honor is a popular choice for the Level 2 or 3 Nature Honor required of FRONTIER GUIDES. The chytrids, represents a group of primitive aquatic fungi. They are characterized by having reproductive cells can move themselves by using whip-like tails called flagella. Synchytrium endobioticum is a chytrid fungus that causes the potato wart disease or black Scab. Batrachochytrium dendrobatidis, discovered in 1998 in Australia and Panama, and causes a disease that kills amphibians in large numbers and has been suggested as a principal cause for the worldwide amphibian decline. Outbreaks of the fungus were found responsible for killing much of the Kihansi Spray Toad population in its native habitat of Tanzania, as well as the extinction of the golden toad in 1989. The zygomycetes, in phylum Zygomycota, are characterized by the formation of sexual spores called zygospores. The zygospores are not contained within a specialized fruiting body or sac. An example of a zygomycete is the common black bread mold, Rhizopus nigricans, which spreads over the surface of bread and other food sources, sending hyphae inward to absorb nutrients. In its asexual phase it develops bulbous black sporangia at the tips of upright hyphae, each containing hundreds of haploid spores. These fungi have many industrial uses including Rhizopus used in tofu production and Blakeslea trispora which is used to manufacture beta-carotene for dietary supplements and other uses. Members of the Glomeromycota are also known as the arbuscular mycorhizal fungi (AMF). This type of fungi is found on the roots of about 80% of vascular plants, where it helps the plant capture nutrients from the soil. The tremendous advances in research on mycorrhizal physiology and ecology over the past 40 years have led to a greater understanding of the multiple roles of AMF in the ecosystem. This knowledge is applicable to human endeavors of ecosystem management, ecosystem restoration, and agriculture. They are also called the “sac fungi” because their sexual spores (ascospores) are enclosed in tube-like sacs known as asci. This group is of particular relevance to humans as sources for medicinally important compounds, such as antibiotics and for making bread, and cheese, but also as pathogens of humans and plants, and for making alcoholic beverages. Familiar examples of sac fungi include morels, truffles, brewer's yeast and baker's yeast, Dead Man's Fingers, cup fungi, and the majority of lichens (loosely termed "ascolichens") such as Cladonia." This class includes the fungi commonly called mushrooms including the common fairy-ring mushroom, shiitake, enoki, oyster mushrooms, fly agarics and other amanitas, magic mushrooms like species of Psilocybe, paddy straw mushrooms, shaggy manes, puffballs etc. A fungi broadly known as earth tongues. The ascocarps of most species in the family Geoglossaceae are terrestrial and are generally small, dark in color, and club-shaped with a height of 2–8 cm. The ascospores are typically light-brown to dark-brown and are often multiseptate. Other species of fungi have been known to parasitize ascocarps. Earth tongues are commonly found in soil or among rotting vegetation. In North America, they are commonly found in coniferous woodland, broad-leaved woodland and mixed woodland habitats, whereas in Europe they are commonly found in grassland habitats. The best way to approach this requirement like all similar nature honor requirements, is to go out looking for fungi, and then try to figure out what you have found. This is far more effective than studying your field guide, deciding what you want to look for, and then going out for a look while walking past other fungi you could be identifying. Also remember the requirement says fungi, so open your eyes to fungi other then mushrooms. It should be easy to find, photograph and identify 15 common fungi if you take your camera whenever you are out walking or hiking anyway. Fungi help decompose rotting stumps and logs, and like moisture, so search appropriately. Look up too, not just down, for some fungi grow on the sides of trees. In the kitchen and garden you might also look for black mold (will mom let you leave some bread out?) and yeasts. For identify fungi outdoors, you will need a field guide (book or online). The field guide you select should cover the area where you are looking for fungi. For example, a field guide to the mushrooms of Australia is not going to help you very much if you're looking for fungi in North America. Here are 5 example fungi used directly for food, as an agent to make food and alcohol, for industrial purposes, for medicine, and as a biological insecticide in farming. Agaricus bisporus is an edible basidiomycete mushroom native to grasslands in Europe and North America. When immature and white, this mushroom may be known as common mushroom, button mushroom, white mushroom, cultivated mushroom, table mushroom, and champignon mushroom. When immature and brown, this mushroom may be known variously as Swiss brown mushroom, Roman brown mushroom, Italian brown, Italian mushroom, cremini or crimini mushroom, brown cap mushroom, or chestnut mushroom. When mature, it is known as Portobello mushroom. A. bisporus is cultivated in more than seventy countries, and is one of the most commonly and widely consumed mushrooms in the world. When people think of a mushroom, this is usually the mushroom that comes to mind first. Perhaps the most useful yeast, having been instrumental to baking as well as wine making and brewing since ancient times. It is the principal source of nutritional yeast and yeast extract ahd is believed to have been originally isolated from the skin of grapes. Better known as A. niger or black mold it commonly spoils fruits and other foods, but this fungus has beneficial uses too. It is used to make citric acid commercially, and it also can be used to make gluconic acid. Both are important food additives. Many useful enzymes are produced using industrial fermentation of A. niger. For example, A. niger glucoamylase is used in the production of high fructose corn syrup, and pectinases are used in cider and wine clarification. Alpha-galactosidase, an enzyme that breaks down certain complex sugars, is a component of Beano and other products that decrease flatulence It is used for food safety as a challenge organism for cleaning validation studies performed within sterile manufacturing facilities. Beauveria bassiana is used as a biological insecticide to control a number of pests such as termites, thrips, whiteflies, aphids and different beetles. Its use in the control of bedbugs and malaria-transmitting mosquitoes is under investigation. Other fungi hold promise for their ability to attack selected insects without hurting other organisms or the plants that the farmer is trying to protect. Here are grasshoppers killed by B bassiana. Alternaria alternata has been recorded infecting over 380 host species. 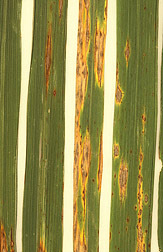 It is an opportunistic pathogen on numerous hosts causing leaf spots, rots and blights on many plant parts. It also causes upper respiratory tract infections in AIDS patients and asthma in people with sensitivity. Harvesting wild mushrooms is an age-old practice and remains an important economic activity around the world. However, there are poisonous mushrooms that look much like edible mushrooms. Be sure to have your pick checked by an experienced mushroom expert or buyer before consuming anything you pick. Better yet, don't pick and eat wild mushrooms at all (unless you are a trained professional). According to the excellent book The North America Guide to Common Posionous Plants and Mushrooms, there are about 100 known poisonous species out of about 5000 named species of mushrooms in the United States. One third to one half of mushroom taxa in the USA remain unidentified and many of the identifed species are not gathered for food and have not been tested for toxicity. The situation in other parts of the world is even worse, where there is often a very limited understanding and no local guides to what mushrooms grow there. Relying on a North American or European guidebook in another region could prove deadly since toxicity levels between similar looking mushrooms vary around the world. Also be aware that mushrooms can be introduced to new regions, often unwittingly brought in soil with nursery stock. If you suspect mushroom poisoning (which may manifest hours after consuming mushrooms), seek immediate medical attention. Bring a sample of the mushroom to the hospital and call a poison control center. Globally, over 50% of mushroom poisonings are fatal, but with good medical care and prompt attention over 90% of victims recover in North America. This page was last modified on 7 July 2016, at 19:02. This page has been accessed 17,271 times.